My research on plasmonic waveguides for integrated photonics was performed during the PhD thesis work. This work took place between February 2007 and December 2009 in the University of Burgundy in Dijon, France in the Nanoscience department in the group of Prof. Alain Dereux. It was then continued from January 2010 during the postdoc in the Applied Physics department in Prof. Harry Atwater’s group at the California Institute of technology. I demonstrated an increase of the propagation length for confined Surface Plasmon Polaritons (SPP) modes in dielectric-loaded surface plasmon polariton waveguides (DLSPPWs). A DLSPPW typically consists of a dielectric strip – usually a polymer – deposited on a metal film . I developed a strategy to partially compensate confinement-induced SPP losses by doping the DLSPPW polymer layer with quantum dots (QDs) nanocrystals undergoing stimulated emission and operating at telecom wavelength . SPPs rely on collective oscillation of free electrons of a metal and appear for wavelengths such that dielectric constant is negative (ε<0). Although promising for nanotechnologies applications as e.g biosensing or integrated photonics they suffer from losses due to dissipation into the metal film. During the course of my PhD work, I demonstrated loss compensation in a plasmonic waveguide using a configuration analogous to an integrated amplifier, that is using stimulated emission of SPPs . This is a key step for fully integrated on-board all-optical (plasmonics) device. Plasmonic waveguides enable transmission of both electrical and optical (plasmonic) signals in the same circuitry, and are therefore of great interest for integrated photonics applications. I addressed here the possibility to compensate at telecom wavelength the losses using a configuration analogous to an optical amplifier. The configuration is described in Fig. 1. A DLSPPW is doped with PbS quantum dots (QDs) emitting around λ = 1.5 µm. The SPP guided mode is excited at telecom wavelength (λ = 1.55 µm) and an additional green laser pumps the QDs in their excited states. QDs relaxation by stimulated emission of SPP partially compensates intrinsic losses. DLSPPW mode propagation length and momentum are measured by leakage radiation microscopy in the image and Fourier planes respectively . Figure 2 represents the mode propagation length versus green pump irradiance demonstrating 27% increasing. A detailed analysis of the experimental data (in particular mode line width narrowing) and comparison with numerical simulations demonstrate the role of stimulated emission of SPP . This experiment demonstrates the surface plasmon loss compensation by the active doped polymer medium . The demonstration of optical gain in plasmonic field offers great perspectives for integrated photonics and paves the way for developing plasmonic amplifiers. My research on resonant dielectric structures for photovoltaics started in January 2010 during my postdoc in Prof. Harry Atwater’s group at the California Institute of Technology. It has led to a patent . Nanospheres form a key element in photonic devices because they can support confined and enhanced electric field as resonant modes . Moreover, the periodic arrangement of nanospheres can lead not only to self-coupling but also to coupling between the spheres and therefore be seen as multi spheres guiding device. The coupling originates from whispering gallery modes inside the spheres. When these resonance occur nearby an absorbing material, it can be coupled and contribute to increase light absorption. This configuration is of great interest for photovoltaic applications. I investigated several configurations based on resonant silica nanospheres atop an amorphous silicon layer. Figure 3. a) Schematic of the dielectric nanosphere solar cell. b) Current density calculated in the amorphous silicon layer with and without the presence of nanospheres. The a-Si thickness is 100 nm and the sphere diameter is D = 600 nm. c) Cross section of a silica nanosphere on an amorphous silicon layer with an AZO and silver back contact layer. d) Integrated electric field and absorption calculated from Figure 1a for normal incidence of a cross section at the center of the sphere at the resonant frequency corresponding to λ = 665 nm. e) Electric field intensity for a cross section at the middle of a sphere in the ( x , z )-plane at λ = 665 nm. Below is an enlargement of the a-Si layer. The direction of the electric field of the incident plane wave is also represented. I proposed here a light absorber based on coupling from a periodic arrangement of resonant dielectric nanospheres. It is shown that whispering gallery modes in the spheres can be coupled into particular modes of the solar cell and significantly enhance its efficiency . I numerically demonstrated this enhancement using full-field finite difference time-domain (FDTD) simulations of a nanosphere array above a typical thin-film amorphous silicon (a-Si) solar cell structure. 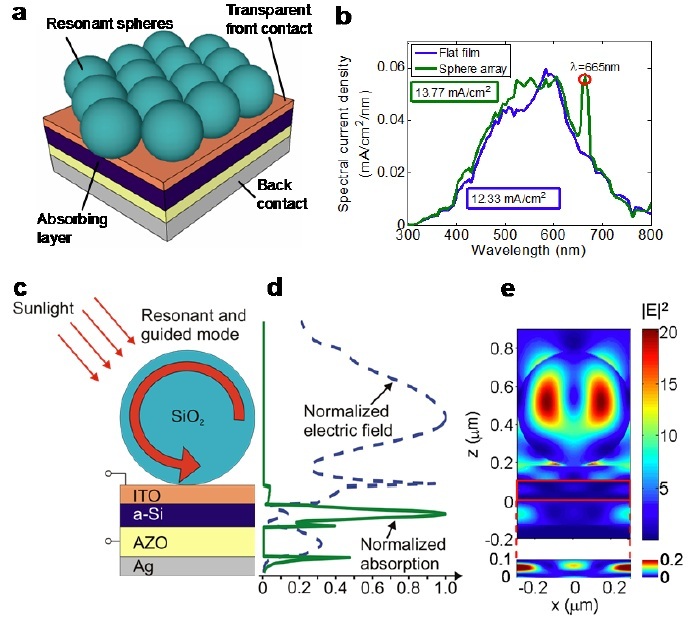 Figure 3a depicts a solar cell where close packed dielectric resonant nanospheres stand atop a typical a-Si solar cell structure. A cross section is represented in Fig. 3c. To determine the influence of the spheres on the solar cell structure presented in Fig. 3a, I calculated the spectral current density in the a-Si layer with and without the presence of 600-nm-diameter nanospheres. The result is presented in Fig. 3b. The overall integrated current density corresponding to the energy absorbed in the a-Si in the presence of the nanospheres is J=13.77 mA.cm-2, which corresponds to an enhancement of 12% compared to the case without the sphere array. At λ=665 nm, the enhancement is greater than 100%. To explain this increase in the current density, I plotted in Fig. 3e the electric field intensity for a cross section in the middle of a sphere in the (x,z)-plane. Two lobes are observed on each side of the sphere. These are characteristic of WGMs. They have significant field strength within the periodic arrangement of the sphere layer. J. Grandidier, S. Massenot, G. C. des Francs, A. Bouhelier, J. C. Weeber, L. Markey, A. Dereux, J. Renger, M. U. González, and R. Quidant, “Dielectric-loaded surface plasmon polariton waveguides: Figures of merit and mode characterization by image and Fourier plane leakage microscopy,” Physical Review B, vol. 78, p. 245419, 2008. J. Grandidier, G. r. C. des Francs, S. b. Massenot, A. Bouhelier, L. Markey, J.-C. Weeber, C. Finot, and A. Dereux, “Gain-Assisted Propagation in a Plasmonic Waveguide at Telecom Wavelength,” Nano Letters, vol. 9, pp. 2935-2939, 2009/08/12 2009. M. A. Noginov, G. Zhu, M. Mayy, B. A. Ritzo, N. Noginova, and V. A. Podolskiy, “Stimulated Emission of Surface Plasmon Polaritons,” Physical Review Letters, vol. 101, p. 226806, 2008. J. Grandidier, J. Munday, D. Callahan, and H. A. Atwater, “WHISPERING GALLERY SOLAR CELLS,” ed: US Patent 20,120,060,913, 2012. A. N. Oraevsky, “Whispering-gallery waves,” Quantum Electronics, vol. 32, pp. 377-400, May 2002. J. Grandidier, D. M. Callahan, J. N. Munday, and H. A. Atwater, “Light Absorption Enhancement in Thin-Film Solar Cells Using Whispering Gallery Modes in Dielectric Nanospheres,” Advanced Materials, vol. 23, pp. 1272-1276, 2011.